Where to start...I realize I'm on the count down to the 10 year anniversary of this blog. Ten years. That's the craziest thing ever. So much has changed, yet so little has changed. I live in the same city, the same house, I'm single. I almost put "still single" but that's not quite right--I've been single, unsingle, dating, etc. I went to live in France. I bought some new bicycles. I bought a brand new car. I made some friends and lost a couple...or drifted apart. I had blog friends, all but one of whom I don't know anymore and most of whose blogs are defunct. Kind of like how this blog is barely a whisper of its former self. On days like today, I worry about myself a little. I slept until around 7am, which is pretty normal for me. then I went back to sleep and stayed in bed listen to podcasts and play games on my phone until nearly 10am. Is that healthy? Am I depressed and don't realize it? I feel pretty calm these days. Not unhappy though I'm not sure I'd say happy either. Moments of happiness, certainly, but mostly just level, even, and not too stressed--but ocassionally stressed--by work. Work is still my main focus and maybe it just has to be that way for a while. I am still adjusting to my role as a "senior" staffer. As a manager. A leader. My ability to lead at work has started to spill over to my daily life where I am making more decisions, taking charge in a group, and generally feeligng pretty comfortable with myself. Not in all areas of course. Of course. Speaking of dating, a boy (blog name "Ben") who I thought I'd never see again has come back into my life. I met him last year and first mentinoned him in a post on 12/15/13. We got together a few times (four times) and then he broke things off by text (see the post from 1/31/14). That was it. In the last couple of months, I have thought of him a few times. I even considered texting him, but then I would remember the last time we saw each other, the extreme awkwardness, and I wouldn't. Then, what do you know, about three weeks ago, he texted me. I was so happy! We got together a couple of days later and again a week after that. He's out of town right now and I'm out of town next week so I figure I'll see him when I get back (this has been discussed). Will we make it more than four dates this time? I'm not so sure. It feels just the same as before (why wouldn't it?). I like him, he likes me. We like to talk. We're not running around having adventures (I'd like to find someone for that! ), but it's all very friendly. I am starting to feel like we really are friends, which is good and odd at the same time. Somehow, it's still awkward with him. I didn't ask him why he broke things off before; honestly it didn't occur to me until I mentioned his reappearance to Pele, who couldn't remember why it had ended before. It just ended, at his request. And, at the time, I reserved the right to ask why but then I never did. Maybe I thought I understood and didn't need to ask. I'm now a little curious to hear his perspective, but I don't know if I'll get around to asking or not. It does make me a little gun-shy--like he might just say, "this is over" at any time, but why worry? Last time, I knew it was going to happen. I have to trust my spidey sense this time too. My gut says it's not over yet--though the anxiety-o-meter is pinging away like crazy. Some things never change. Anyway, I am glad he's around but I feel some of the frustration I did last time. There are non-break up things I want to talk to him about but I can't quite go there. Oh, and this is the thing, he's planning to move to New York in December. We have a time limit. No need to worry about breaking up--he'll move first. I'm not sure if that's comforting or sad. Perhaps both. Other than that, I'm planning to visit KJ for Thanksgiving. I up and invited myself but she seemed happy to have me. Last year, I went home to Seattle, but it was kind of miserable. Then in December I have a trip to Israel booked. Going with Dad and Susan. Tacking on a week split between London and Paris beforehand. It should be great. Cold, miserable, but great. I'm already planning my wardrobe. I bought a pair of boots and I'm testing them today--good thing because the insole in one is messed up. Plenty of time to fix it or exchange them. I'm also on a vest-hunt. I decided layering a vest over my Icelandic sweater (the one I finished knitting last winter) would be the right outer wear to bring since it doesn't get super cold in either London or Paris. I will be walking a lot so I don't want to bring a heavy coat. My sweater and a down vest...perfect, right? We'll see. I'm ordering lots in the hopes of finding one that fits well and looks decent. Boring. I feel boring. I've been feeling a little weird recently...a bit off. Some days I feel "heavy" like a weight is pulling my whole body down. Usually it passes quickly but I wonder what it means. Am I sick? Do I just need more sleep? Or more exercise? Or a better reason to get up in the morning? Work is a reason but it's never going to be the best reason. Maybe I need to spend a little more time on the blog. I'll think on it. 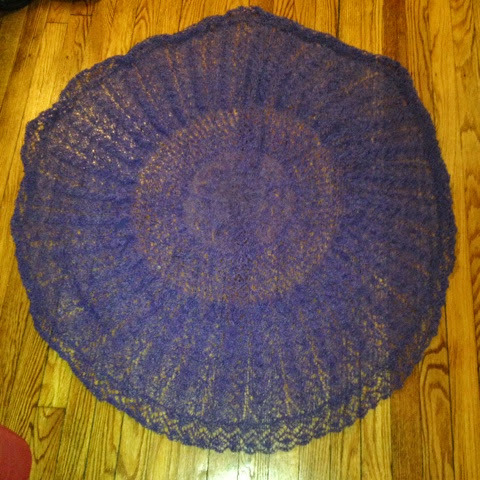 Oh--and here's this pretty shawl I just finished knitting. Maybe next time I'll post a pic of it after blocking. Grateful for: having an outlet when I need it. 10 years! Well, not so long compared to how long I've known you. It is good to have a boy to distract you a little bit and balance out the focus on work. Sorry things have been a little off, but it sounds like you're on the right track to figure something out that will help. I will try to check in for real soon! Congrats on the upcoming anniversary. It's hard to keep anything going for ten years, so it is a genuine accomplishment. As you may have seen, you were featured on DCBlogs--which may be how I first discovered you. Best wishes. Back in the day, I checked my stats obsessively, then religiously, then regularly. Now, only rarely. Which is a long way to say I didn't know I'd been featured on DC Blogs. Thanks for letting me know! Always good to hear from you. And thanks for the good wishes. For me, a vest with my Icelandic sweater (bought, not made) would not be enough to keep me warm in London or Paris in Dec.
Well, I don't think many folks have stuck around. You should see my stats! That's what I get for being inconsistent. :) THANK YOU for reading! As for the vest, it's dipping into the 50s here and I need either a light wool jacket OR a sweater. Not both. I seem to run very warm these days and only need a proper coat in the polar vortex--even then I got away with a non-down coat, layered with a couple scarves, hat, mittens and long johns. We'll see. I'll keep checking the forecast as the time gets near.